I will admit: last month when my girlfriend started swooning and gushing over the BBC series Sherlock, telling me that "you have to watch this!" my internalized reaction was something akin to "oh geeeeez... NOT another Sherlock Holmes adaptation." No disrespect intended but seriously: how many times can one go to 221 B. Baker Street and not know what to expect? I've probably watched all the Sherlock Holmes movies with Basil Rathbone, along with 1985's Young Sherlock Holmes (does John Lasseter's computer-animated stained-glass knight still astound, or what?) and everything in between. Even The Adventures of Sherlock Holmes' Smarter Brother. Be it straight adaptation or screwball comedy, when it comes to Holmes I've seen it all. But Kristen wanted to share that weekend together watching the six episodes comprising Seasons 1 and 2 of Sherlock. Quietly resigned to anticipating nothing to write home about, I settled onto the futon with her and the cats as the Roku began streaming away. Leave it to series creators Steven Moffat (Doctor Who's current showrunner) and Mark Gatiss to shatter my expectations more than I have experienced from any television series in at least ten years. Sherlock is arresting television of the highest caliber. And with production beginning next month for Season 3, I find myself going positively bonkers with giddy waiting for the new episodes. Sherlock takes everything about Holmes and his world and throws it wholesale into the gamut of the Twenty-First Century. I know what some of y'all are thinking: "oh crap you mean it's 'Sherlock Holmes is a fish out of water' again?!" Be of good cheer: Holmes is not cryogenically frozen and thawed-out in modern-day London (yeah I even saw The Return of Sherlock Holmes). THIS Holmes is a character so firmly planted in the Twenty-oughts yet wildly faithful to the original stories that one envisions Arthur Conan Doyle composing his Sherlock Holmes tales on a laptop at Starbucks. I'm going to first remark that Martin Freeman as John Watson is one of the many things that make Sherlock such brilliant drama. Freeman's Watson is a considerably traumatized British army doctor who served in Afghanistan (an update to Doyle having Watson in the second Anglo-Afghan war). Coming to have Holmes as a flatmate at 221 B. Baker Street (owned by Mrs. Hudson, delightfully played by Una Stubbs) and the growing friendship between him and this strange "consulting detective" gives us an average person's perspective on Holmes, but it is also compelling to watch Watson's recovery unfold for its own sake. Part and parcel to that is the blog that Watson maintains about Sherlock's various cases: another slick upgrade for the new millennium. I first got to behold Freeman in The Hobbit: An Unexpected Journey and quickly became a fan. It's even more a joy to watch him as Watson. 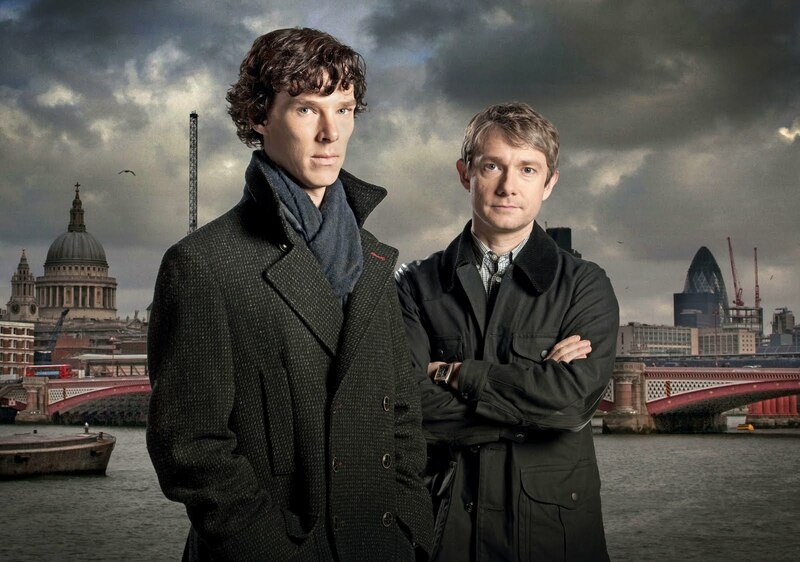 Sherlock is not your standard television fare. With two seasons there have been only six episodes. But you'll be hard-pressed to notice. Each runs an hour and a half and they are packed tight with a florid spectrum of drama and humor. Indeed, I felt like I was watching a series of high-budget motion pictures rather than a series produced by the BBC. The episode titles alone hint at the direction of the show: "A Study in Pink" and "The Hounds of Baskerville" will elicit a smile from even the casual Holmes fan. Many will spot the many sly nods and winks at the original Holmes stories (incidentally, the episodes themselves are credited as being based on Doyles' works). But what has captivated me most about Sherlock is Holmes himself, portrayed with power and precision by Benedict Cumberbatch. And I'll tell you why: Sherlock's Sherlock is already the character who, more than any other that I can remember from television, I find myself identifying and empathizing with the most. For all of those who ever wanted to have Sherlock Holmes' deductive abilities: forget about it. Because here Sherlock is revealed as a man whose observational prowess is as much curse as blessing... perhaps more so. Cumberbatch's Sherlock is a surly and antisocial man divorced from many facets of the human condition by what can only be described as enhanced mental acuity at best and highly functional mental illness at worst. There are certainly indications that Sherlock has Asperger's syndrome and that his deductive skills are a thing that can not be turned off. Distracted from, yes (sometimes by firing pistols at the walls) but a complete escape from? Never. Whatever falls into Sherlock's line of sight, his mind falls upon with the focus of a laser and analyzes with brutal calculation. The writing, the acting, the cinematography, the gorgeous London scenery... all of those and more make Sherlock hopelessly entrancing. The show's score by David Arnold and Michael Price is as hypnotic as it is elegant, particularly the theme music (which I often find playing away in my head... and I don't mind that one bit). It's also available on iTunes. Sherlock is television the way it could be and ideally should always be. There has been darned few series of this quality from America studios. With Sherlock, our Brittish brethren have set a high bar and one that us Yanks would do well to be inspired and encouraged from. Whether you watch it on streaming video from the Internet or BBC America or on Blu-ray (which I shall endeavor to purchase soon), Sherlock gets this blogger's highest possible recommendation. It is television of the finest kind and it is not something you want to miss!